If you have spent any time on Instagram recently or perused through the beauty aisle at your go-to store, it’s hard to ignore the popularity of Korean beauty and skincare products. Fans of the K-beauty phenomena (an umbrella term used to reference the vast import of products out of South Korea) rave about the benefits including hydration, reduced pores, and overall skin health. A girls night these days might include 15 minutes spent with a sheet mask (complete with the obligatory Instagram selfie) and even Sephora has started to stock K-beauty stalwarts such as essence and foam cleaners. But in a region with award-winning Asian cuisine and vibrant east Asian community, there are a surprisingly limited opportunities to shop this innovative beauty movement. 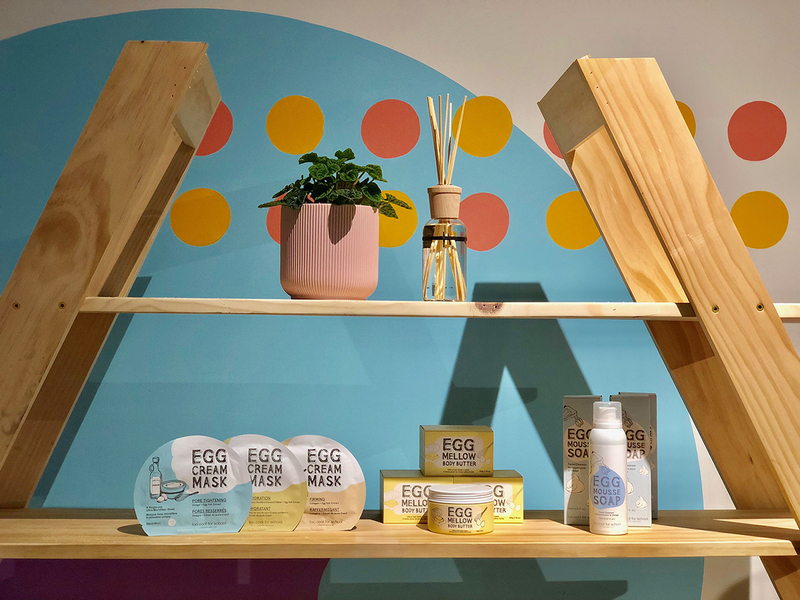 Well, K-beauty enthusiasts will soon have the opportunity to stock up on their favorite products starting this Sunday with the opening of K Ba-nana, a curated Korean beauty pop-up boutique taking over the recently abandoned Apple Store in University Village. We had the opportunity to talk exclusively with founder Liz Kang Yates about the concept, what shoppers can find and which skincare steps she cannot miss. SM: Where did the idea for a Korean beauty pop-up come from? LKY: My friends and I have always loved trying new products and kept finding amazing ones when we visited Korea. With the trend gaining momentum, I wanted to create an original brick and mortar concept that allows shoppers to discover the benefits of K-beauty. What can shoppers expect to find at K Ba-nana? Korean beauty products are known for their bright colors and whimsical advertising, so I designed a unique immersive experience to complement that feeling. We have sourced all of our products from Korea that include beauty must-haves like lipstick, eyeliner, and elevator mascara. There will also be gel nail stickers that stay on for several weeks. And since sheet masks are so popular there is an entire wall with over 150 different types. We hear there are artistic elements in your store. I worked with Jesse Brown, a local artist and illustrator recently contributed to the large SODO track mural, on some of the visual elements for the store. For example, he designed a 5-foot neon banana and painted colorful murals on the walls. How do you describe Korean beauty to those who might not be familiar? Korean consumers tend to be early adopters of beauty trends and there are always new and innovative products being made there. K-beauty also incorporate many traditional practices such as fermentation that result in amazing benefits for the skin. Shopping for K-beauty should not be an intimidating experience either. There will be items in the store that start at $2 next to more high-end beauty products around $70. Tell us a little about your own skincare routine. I use a cleansing foam in the morning and before I go to bed followed by a toner from Huxley Cosmetics. I also love the serum and moisturizer from 107 which uses a fermented vinegar that takes seven years to harvest. And depending on what my skin needs, I typically use a sheet mask on my face every day. K Ba-nana is located at 2656 NE University Village St. and will be open Monday through Saturday from 9 a.m. - 9 p.m. and Sunday from 11 a.m. - 6 p.m. You can also follow them on Instagram at @hellokbanana.